Prof. Zhaxybay Zhumadilov, General Director, National Laboratory Astana was awarded a letter of thanks from Kalmukhanbet Kassymov, Colonel-General, Minister of Internal Affairs of Kazakhstan. Zhaxybay Zhumadilov is a member of the Public Council under the Ministry of Internal Affairs. The Public Council was established in accordance with the Kazakstani Law "On Public Councils" and the message of the President of the Republic of Kazakhstan “100 concrete steps to implement the five institutional reforms." As it is known, prominent figures of culture, education, science and sport, as well as members of parliament and human rights activists are invited to work for such public councils. Minister Kalmukhanbet Kassymov said, members of the Public Council under the Ministry of Internal Affairs conducted a great deal of work, including active participation in discussions on number of laws projects during scientific conferences and different level meetings. read our new NLA Handbook-2016! Nazarbayev University is the best among the most cited scientific organizations of Kazakhstan according to “Thomson Reuters” company. The award ceremony will be hold soon on 18 November in the framework of "Science and Innovation - the basis of economic development" forum, which is organized under the auspices of "National Scientific and Technical Information Center" JSC jointly with “Thomson Reuters” company. 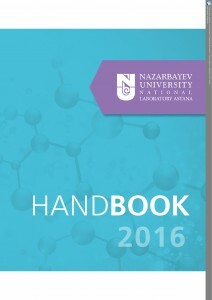 Researchers from Nazarbayev University Dr. Almagul Mentbayeva, Adil Ashirbekov, and Marina Kishkentaeva became the winners of «Leader of Science-2016" independent award for high rates of publication activity and citation of information resources according to Web of Science data (Thomson Reuters). Young scientists have won in the nomination "Articles of Kazakhstan in journals with high impact factor": the leading researcher of National Laboratory Astana, Nazarbayev University Dr. Almagul Mentbaeva is encouraged for the publication of "Small-moleule-hosting nanocomposite films with multiple bacteria-triggered responses" at «NPG Asia Materials» journal with impact factor 8.77; junior researcher of School of Education at Nazarbayev University Adil Ashirbekov and NU senior manager Marina Kishkentaeva - for the article "Promoting development of human capital: the typology of international scholarship in the field of higher education programs" in «Educational Researcher» journal with impact factor of 3.05. It should be reminded that in 2015 the well-known scientists of Nazarbayev University Dr. Zhumabay Bakenov and Dr. Asiya Yermukhambetova also have won «Leader of Science» award according to Thomson Reuters for the joint work with Canadian partners to create the new composite cathodes for the battery. 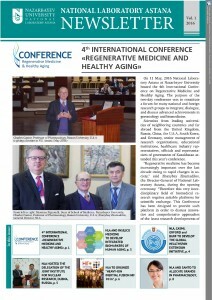 Researchers from the National Laboratory Astana successfully performed during «Biomaterials for Healthcare: Tissue and Genetic Engineering and the Role of Nanotechnology» (BioMAH) international scientific conference in the heart of Italy, where scientists and biotechnologists from more than twenty-five countries around the world came together. This conference covered various issues regarding innovative biomaterials and approaches for tissue regeneration. Its scope was to create a platform for exchanging the latest research results and sharing advanced methods between the scientific community and industries. Participants from various countries attended the conference, among them leading researchers in the biomaterials science field, manufacturers from orthopaedic surgery, neurosurgery, dentistry and pharmaceuticals, engineers, biologists, surgeons, physicians, dentists and other clinical personnel, closely connected with the application of biomaterials. During the conference NLA’s team from the Laboratory of Bioengineering and Regenerative Medicine presented the results of several research projects in the field of regenerative medicine and tissue bioengineering. The results of the scientific and technological project such as "Mesenchymal stem cells coated with synthetic bone-targeted polymer as a new approach for managing of osteoporotic bone fracture regeneration" presented by Julia Safarova, NLA junior researcher was highly appreciated by the expert commission of BioMAH- 2016. The project won the first prize in "The best oral young researcher's presentation» nomination. According to Sholpan Askarova, head of Laboratory of Bioengineering and Regenerative Medicine, NLA given that the osteoporosis is spread vastly around the world, and due to high level of disability of osteoporosis-related fractures, the scientific group of the laboratory has been developed a method of stimulating the regenerative osteogenesis, including the injection implantation combined a mesenchymal stem cells coated with synthetic bone-targeted polymer in the zone of osteoporotic bone fracture of the experimental animal model. This methodology will improve the bone tissue regeneration and can serve as a basis for the development of the promising cell engineering approaches in the treatment of osteoporosis-related fractures, which will contribute to improving the quality of life and reduce the disability of patients in this category. National Laboratory Astana announces call for applications for seminars and trainings on management of research and GCP. Programs of the seminars will include series of lectures, individual tests for the absorption of the lecture material, group lessons with a tutor, the preparation and presentation of the project research. NLA is an integral part of an integrated academic health system of Nazarbayev University, which includes clinics of National Medical Holding and University Medical School. NLA has already been successfully conducted training seminars and workshops at national and international levels. National Laboratory Astana hosts “Low-Carbon Energy Future for Kazakhstan” three-day workshop for young scientists of Kazakhstan in the framework of the partnership program "Newton-Al Farabi." During the opening ceremony Kanat Baigarin, Vice-President for Innovation, Nazarbayev University stressed out, that proposals and achievements of young researchers would help to highlight the problems and prospects of development of alternative energy sources, energy conservation, as well as the principles of the solution of environmental problems in Kazakhstan. "Kazakhstan is gradually incorporated into the international process to establish new standards and norms of resource conservation. Such expression as a "low-carbon economy" is becoming synonymous of the future of mankind. To make it an integral part of the economic development of the modern state, to learn how to reduce CO2 emissions, to implement energy efficient technologies and ensure universal access to sustainable electricity - these all difficult tasks, on which scientists around the world are working, including here, in the Nazarbayev University,” - said Kanat Baigarin. The seminar is attended by 17 young scientists from research centers of the UK, such as Cranfield University, University Aberdeen, University College London, University of Surrey, Newcastle University, De Montfort University, and 23 Kazakstani participants from National Laboratory Astana, Nazarbayev University, KEGOC company, Atyrau oil and gas University and others. It is expected that within three days of plenary sessions, researchers from the UK and Kazakhstan, who won grants to participate in this workshop, will discuss their research projects, as well as will begin to work together on key issues related to economic and social development of Kazakhstan. About the Newton – Al-Farabi Partnership Program. This is is a five-year, £20 million joint program launched in 2014 by the UK Government and the Government of the Republic of Kazakhstan. Each side provides equal funding. By working together on bi-lateral and multi-lateral programs the UK and Kazakhstan hope to develop existing contacts and build strong, sustainable, systemic relationships in research and innovation. The Newton – Al-Farabi Partnership Program is coordinated by JSC Science Fund, for Kazakhstan, and the British Council, for the UK. read our 2016 NLA newsletter. Today, Nazarbayev University hosts the XXI International scientific conference on physics «Heavy-Ion Inertial Fusion HIF 2016" - the important scientific event in the series of preparatory activities for the International specialized exhibition EXPO - 2017. The subjects of the conference devoted to the future of Energy - the inertial fusion, the method, which is one of the possible solutions to global energy challenges. During the conference experts in the field of inertial fusion, physics of accelerators and lasers, dense plasma physics will discuss the current state and the future development path of unlimited future energy source - heavy-ion inertial fusion. The conference is attended by well-known scientists from countries near and far abroad and Kazakhstan as well. This event is organized by members of the international committee of the conference, led by the German physicist professor Dieter Hoffmann (GSI Helmholtz Center for Heavy Ion Research), Joe Kwan and Peter Seidl from the Lawrence Berkeley National Laboratory, USA, Shigeo Kawat, Japan, professor of Tokyo Institute of Technology, Jun Hasegawa, Gennady Remnev (Tomsk, Russia), and other world-class physicists. The Kazakh side is headed by the co-chairmen of the conference: Kanat Baigarin, Vice President of Innovation and Science of the Nazarbayev University, and professor Alexander Tikhonov, Nazarbayev University. The history of the conference «Heavy-Ion Inertial Fusion» started in the Lawrence Berkeley National Laboratory, USA, in 1976. In recent years, the conference was held in Princeton (New Jersey, USA, 2004), Saint-Malo (France, 2006), Tokyo (Japan, 2008), Darmstadt (Germany, 2010), Berkeley (California, USA, 2012), Lanzhou (China, 2014). Every two years specialists from all over the world in the field of nuclear fusion, physics accelerators and lasers, as well as dense plasma physics meet to discuss the latest researches and the exchange of opinions on controversial issues. One of the goals of this year's conference is to strengthen existing and develop new areas of cooperation between universities and scientific centers of Kazakhstan and the CIS with the international community, to stimulate further progress in the understanding of inertial fusion energy production, science and technology. HIF2016 main directions include discussion of inertial fusion on heavy ions and other programs; the properties of the excited state of hot, dense matter: theory, experiments, modern diagnostic methods; ion sources and accelerators of powerful, powerful pulse technique. In addition, researchers will exchange views on the interaction of beam-plasma atomic processes in plasma, the interaction of laser radiation with plasma. Also, researches will discuss the TOKAMAK, nuclear physics in Kazakhstan, as well as the study of dark energy and dark matter. These and other areas are being actively developed at National Laboratory Astana, Nazarbayev University, with the participation of leading Kazakhstani and foreign scientists. The National Laboratory Astana created a test ion accelerator INURA, the concept of which was developed in conjunction with the American and Russian scientists. Kanat Baigarin, Vice President of Innovation and Science of the Nazarbayev University, said that HIF2016 - is a great opportunity for the integration of universities and research centers of Kazakhstan in the international community in the field of physics and to access to world-class research. In addition, HIF2016 results will contribute to the search for solutions to global energy challenges, which will be discussed at the EXPO-2017. The 21st International Symposium on Heavy Ion Inertial Fusion (HIF 2016) to be held in Astana, Kazakhstan on 18-22 July 2016. This symposium continues the series of symposia that began in Berkeley in 1976. The most recent symposia occurred in Lanzhou, China (2014), Berkeley, USA (2012), Darmstadt, Germany (2010), Tokyo, Japan (2008), and Saint-Malo, France (2006). The purpose of the symposia is to review the status of heavy ion fusion research, and to stimulate further progress in understanding inertial fusion energy production and the science and technology needed for its implementation. Heavy-ion accelerators are promising candidate drivers for energy production due to their high repetition rate and high efficiency. We also expect to critically access the PW-laser applications in ICF (Inertial Confinement Fusion). A positive emphasis will be also given to the ongoing heavy ion accelerator projects at large institutions located in Europe, Russia, China, Japan, USA and others. In order to support young scientists and students under the age of 35 years to improve their skills and gain experience in scientific research, to assist Kazakhstani young scientists and students in accessing domestic and international informational and academic resources, the "SANTO" company is launching a competition on innovative projects that is based on compounds of the plant origin. SANTO in collaboration with National Laboratory Astana, Nazarbayev University will allocate funds (grants) for the implementation of the project of the academic program to conduct research in the field of pharmacology. Total amount of the grant is 2 million tenge. The deadline for application submission is 15 September 2016. Please, send your application, supporting documents, and any questions regarding the application process to ysa.cls.polpharma@gmail.com. Grants allocation is based on the competition. Announcement of the results of the competition and the award ceremony will take place after 30 September 2016 at Nazarbayev University. Find more info on FB: https://www.facebook.com/nla.nu.edu.kz.